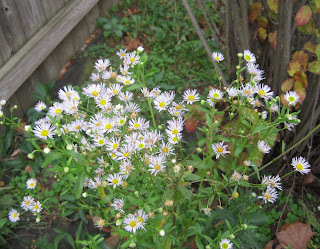 Boltonia, a perennial flower native to the Eastern United States, grows in my garden in two places. 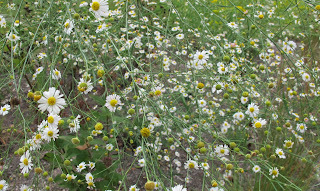 In the August Dreams Garden border, a named variety of Boltonia, Boltonia asteroides 'Snowbank' covered part of the high summer blooming border in mid-September. In an area that I call The Shrubbery, Boltonia asteroides bloomed in mid-November where I never planted it. Based on that, I called it a weed in my November bloom day post. 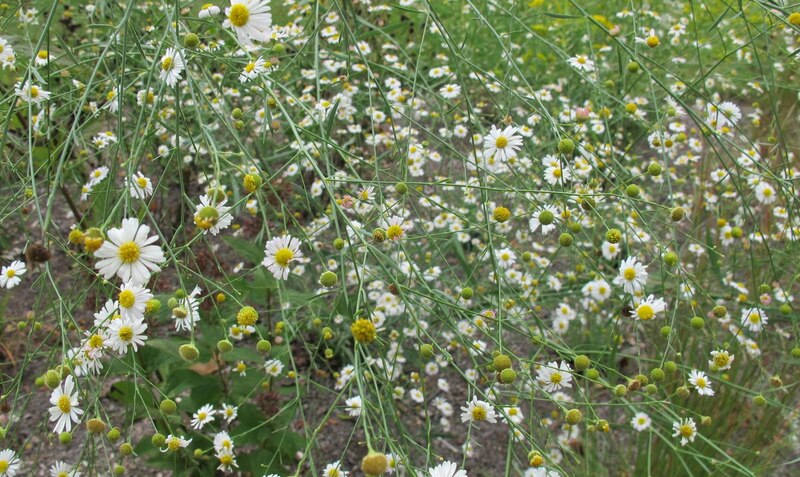 Then someone emailed me and pointed out that Boltonia isn't a weed, it's a perennial flower. But this Boltonia showed up out of nowhere in a place where I didn't plant it. Does that alone make it a weed? It appears, too, to be in its native form and doesn't have that same airy quality that the named variety 'Snowbank' has. Does that just mean it is a wildflower? Weed or wildflower? Take your pick. I choose weedy wildflower. I think I have had some Boltonia appear here, too. I usually call it a weed until it's blooming--then it's definitely a wildflower! Wishing you a very Happy Thanksgiving, Carol! I'm with you - unwanted flowers are weeds. The fact that they're perennials just makes the weeder's work a little harder.